While some people prefer to always be the winner or the strongest, others find themselves drawn to the scrappy underdog. 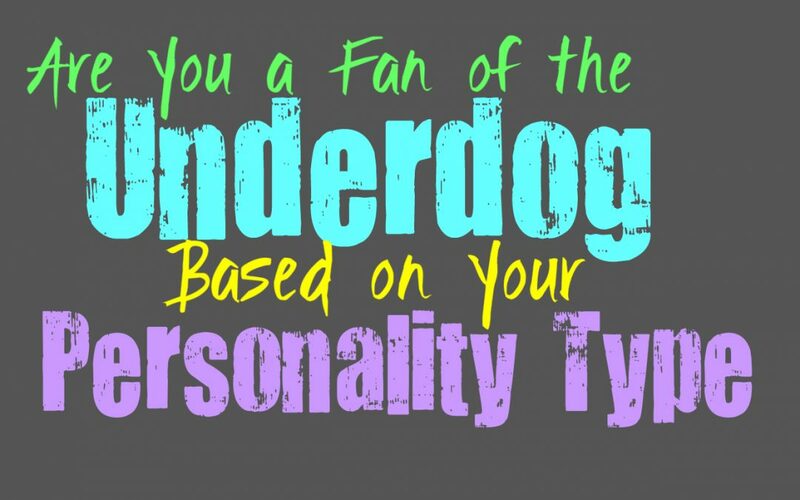 Here is how you feel about underdogs, based on your personality type. INFJs definitely find themselves rooting for the underdog fairly often, since they can often feel like the underdog themselves. They believe in people who have been held back or pushed down in life, and can often see the abilities within them. INFJs don’t like rooting for the top dog, since they often sense some sort of privilege or arrogance which isn’t something they are drawn to. For them it is truly rewarding to see someone who struggles to succeed find a way to overcome their challenges and come out strong and win in the end. ENFJs are naturally winners who fight to be successful, but they believe in doing this by working hard and doing whatever they can to get there. While ENFJs might work hard to be the best, that doesn’t mean they aren’t fans of the underdog. They often root for people who others don’t expect to win, since they can see something inside of them that is ready to come to the surface. ENFJs believe in people, especially when they find themselves drawn to a special quality within them. While they believe in always being the best at what they do, they often feel like people who have hurdles and struggles are the ones to really root for. INFPs are absolutely the ones to root for the underdog, since they often feel like one themselves. They often see themselves as a bit of an underdog and might feel like people underestimate them and their abilities. For INFPs it is more rewarding to root for the underdog than the person at the top of the ladder. They enjoy seeing people who struggles and have sincere experiences, and who find a way to rise above these difficulties. For the INFP the underdog means more than just an entertaining story, it is often a part of who they are and what represents them inside. ENFPs are definitely drawn to the story of the underdog, and often find themselves feeling connected to those emotions deeply. For the ENFP it is so much more fulfilling and rewarding to root for the underdog, rather the person everyone expects to be the best. They believe in going after what they want, and they often feel like a bit of an underdog themselves in some ways. ENFPs realize that people who are underestimated can often rise above and become a force to be reckoned with. They often are drawn to underdogs, but in some instances they can overlook them if someone else has a quality that really excited them. While INTJs might feel a bit of an intrigue to underdogs, this is something they usually keep inside. INTJs are naturally winners who are drawn to whoever finds a way to be the best. For them it doesn’t matter if they have had hurdles, or if they have had more opportunities, the results are often what matters most. They believe in working hard to be efficient and get things done, regardless of what does or does not stand in their way. INTJs aren’t often fans of excuses, but they will respect an underdog if they are capable of rising above their struggles and becoming someone to really be proud of. ENTJs are more drawn to results and efficiency, and so they aren’t really interested in focusing on who is the underdog or the top dog. For the ENTJ it is about getting to the finish line and making sure everything is perfectly executed, whether or not you are the underdog doesn’t really matter to them. They definitely feel a sense of accomplishment if they have to face more hurdles than someone else, but they don’t like comparing or letting these things stand in their way. For the ENTJ it is more about results and efficiency, than anything else that might make things more challenging. INTPs can often feel like the underdog themselves, and because of this they have an affection towards people who struggle to overcome certain things in life. INTPs don’t often find themselves intrigued by those who are at the top already when they continue to accomplish their goals. Someone who faces struggles but strategically finds a way around them, this is extremely interesting and admirable for them. INTPs want to use their minds to overcome things in life, and so when they witness someone who is capable of this it is certainly a draw. ENTPs find themselves drawn to many different ways of behaving and many different experiences in life. They might find themselves rooting for the underdog, but it entirely depends on the situation and the person. They don’t just root for someone who is the underdog just because they are labelled this way, since there has to be something more which makes them support that person. ENTPs do like seeing people rise above their struggles, but they also want to feel inspired by their creativity and unique approach towards things, no matter where they come from in life. ISTJs might be intrigued or impressed by the underdog who rises above, but they don’t just root for them. For the ISTJ it is about producing results and working hard to accomplish their goals efficiently. They believe that people should strive to overcome their struggles and not constantly complain about them. They don’t allow anything to stand in their way since they believe in hard work and constant effort. They are strong-willed people and for the ISTJ being the underdog would not be something that would stand between them and success. ESTJs can sometimes find themselves intrigued by the story of the underdog who rises to the top. This doesn’t mean they will only support or root for someone who is the underdog, instead they simply look for whomever is accomplishing their goals efficiently. ESTJs work hard and believe in giving everything their all, even when there is something standing in their way. They support the people who do whatever it takes to be their very best, and for them it often doesn’t mean discriminating based on their natural abilities or position in life. ISFJs are often drawn to people who need a leg up in life, and so for them the underdog can definitely be someone to root for. They care about people and are sensitive to their needs, which often leaves them wanting to save or help those which seem like they really need it. ISFJs might be less in support of those who are already at the top, since they don’t seem to really need the extra help. When someone is the underdog who constantly seems to be knocked down, they want to do what they can to help lift them up again. ESFJs do often support the underdog, especially if that person really need the extra help to get where they deserve to be. They find themselves really drawn to the more emotional and sentimental stories, and so for them it is rewarding to really stand up for the underdog. ESFJs are compassionate people who are naturally sensitive to the emotions and needs of those around them. When they see an underdog they often are drawn to them and want to help them rise to the occasion. ISTPs are definitely drawn to someone who is naturally at the bottom but finds a way to rise to the top. They don’t do this because they are emotionally based people, but more from a practical point of view. Seeing someone who is capable of overcoming struggles and rising to the top, is truly something which proves to them that is can be done. ISTPs enjoy people who don’t complain about their troubles, instead they find a way to accomplish their goals. ESTPs find themselves drawn to whatever inspires them in the moment, whether it be the winner or the underdog. They go with what feels right and whichever person truly leaves them feeling more excited and passionate. ESTPs do sometimes enjoy the underdog story, but they don’t pick someone just because they are labelled this way. For them it can go either way and it truly depends on the specific circumstance and what is affecting them in that situation. ISFPs are inspired by people and situations which they feel most connected to. If they feel like the underdog is someone they can understand in that situation, then they will certainly root for them more. While some ISFPs might be the scrappy underdog, the ones who don’t feel this way might lean more towards the people at the top of the ladder. They are sensitive people but they want to feel connected to others and so that is often what draws them in a specific direction. ESFPs follow their hearts wherever they might lead, and sometimes this means they find themselves rooting for the underdog. For them it really depends on the present moment and the specific things which drive them towards a person or thing. When the ESFP sees someone they feel connected to, they will certainly want to root for them to be the best, whether they are the top dog or the complete and utter underdog of the situation.